Farrar, Straus and Giroux (BYR), 9780374304997, 192pp. After wacky third grader Hazy Bloom starts seeing visions of things that will happen one day in the future, she hopes her "tomorrow power" will help her get the pet she's always dreamed of in Hazy Bloom and the Pet Project, a hilarious chapter book by Jennifer Hamburg with illustrations by Jenn Harney. It's the annual Third Grade Leadership Challenge, where each third-grade class plans and hosts a fundraiser. Hazel "Hazy" Bloom, however, has other things on her mind—like proving to her parents she’s responsible enough to get a pet iguana. 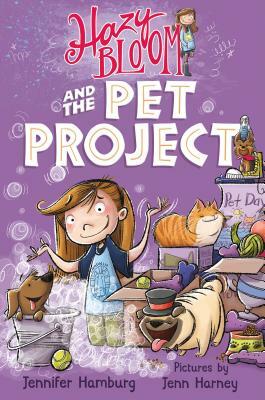 But when Hazy's "tomorrow power"—her ability to see visual clues about things that will happen one day in the future—mistakenly causes her to have a brilliant idea for a Pet Day fundraiser, her classmates put her in charge. Hazy's annoyed, until she realizes that if she helps the class win, her parents will finally see that she's responsible enough to get the iguana she's dreaming of. Soon, Hazy’s determined to make sure her team ends up on top—but it’s not so easy when her tomorrow visions keep throwing her plans into disarray! Jenn Harney is an illustrator and toy designer whose work has been featured in Highlights for Children magazine. Jenn lives in Cleveland, Ohio, with her husband, her daughter, a dog named Steve, and a fish with nine lives. She is the author of the Hazy Bloom series, including Hazy Bloom and The Tomorrow Power and Hazy Bloom and The Pet Project.